Blog » Health Blog » How to Prevent Carpal Tunnel Syndrome? How to Prevent Carpal Tunnel Syndrome? Carpal Tunnel Syndrome usually develops from problems in a nerve in the wrist and may cause pain, tingling sensation in your hand as a result of the pressure on the median nerve in your wrist. Carpal tunnel syndrome mostly happens when the hand is doing activities that involve forceful or repetitive hand or wrist movements especially using the vibrating equipment. The good news is there are carpal tunnel syndrome prevention steps that can be taken to prevent the development of the disease by taking a few simple steps. So, let us now, find the answer to “How to prevent carpal tunnel syndrome”. Beware of your weight gain and follow a healthy routine. Eating healthy is the key to maintaining an active weight. It is good to be active and avoid the sedentary lifestyle and the many disadvantages associated with it. Few ailments like arthritis may further worsen your conditions. Knowing either of them can be aggravating, for the other should be kept in mind and always addressed in advance. Want to know how to prevent carpal tunnel syndrome? – here is one of the major tips! Your workspace should be designed as per the ergonomic guidelines. 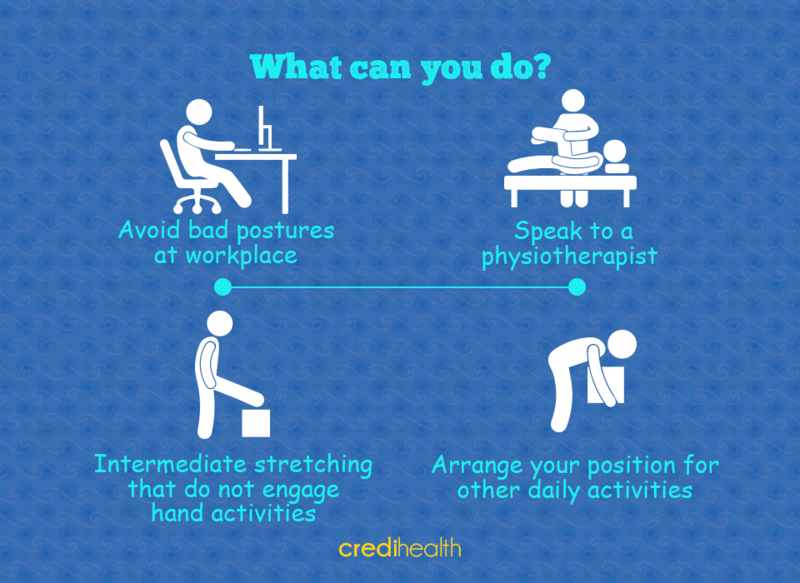 Much of these guidelines delineate how is your desk placed, and alignment of monitor, chair, computer keyboard and mouse, to avoid issues pertaining to bad posture and prolonged exposure to these conditions. Your posture should be uptight and the hand should be used repetitively for multiple activities throughout the day to ensure carpal tunnel syndrome prevention. Small breaks between different activities are advisable. The same ideas can help you arrange your position for other daily activities. Change of positions, intermediate stretching and alternating with activities that do not engage hand activities would help in carpal tunnel syndrome prevention. Speaking to a physiotherapist would surely be very helpful since he can identify things which are not yet amenable for your health issues and suggest ways to make changes. I hope this article helps you understand as to how to prevent carpal tunnel syndrome effectively. It is essential to note that persistent pain, numbness and tingling, or weakness of the hand needs immediate medical attention and a doctor should be consulted for deciding further course of action. The condition is reversible in the initial stages, but may gradually become irreversible, if not treated in time. Get to know and learn a few Easy Exercises for Office Goers.